Shuffle 1 “Harpie Lady Sisters” from your Monster Zone into the Deck, then you can Special Summon 3 “Harpie” monsters with different original names, 1 each from your hand, Deck, and GY. For the rest of this turn after this card resolves, you cannot Special Summon monsters, except WIND monsters. If this card you control is destroyed by a “Harpie” card’s effect or your opponent’s card effect: Add 1 “Harpie” monster from your Deck to your hand. You can only use each effect of “Harpie Lady Elegance” once per turn. 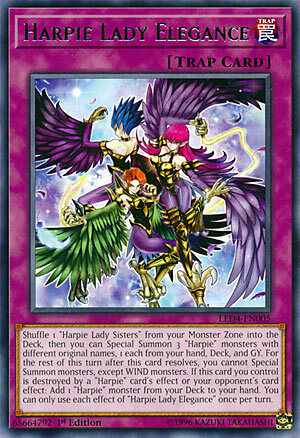 Harpie Lady Elegance is the third Trap for the archetype. You need a “Harpie Lady Sisters” for this card to be playable…that’s a downer straight-away. HLS isn’t a great monster, even surrounded by support in the archetype. You swap the HLS for a Harpie in the deck, hand, and grave off this trap. If Harpie Lady Elegance gets destroyed by your Harpie effect or by your opponent you get a RoTA for your Harpies. This card is slow and too situational. It locks you out of Special Summoning anything other than WIND monsters, you need a Harpie in the grave and in the hand for it to go off, and you need that HLS on the field. Too much for getting those three monsters. You are better off running more offensive traps like Icarus Attack and use other archetype cards to cycle through your Harpies. Next up in the Harpie week is the new Trap card the archetype got, Harpie Lady Elegance. Harpie Lady Elegance is a Normal Trap that when activated will shuffle a Harpie Lady Sisters you control from the Monster Zone into your deck to then let you Special Summon 3 Harpie monsters (1 each from your hand, deck, and GY) and for the rest of the turn after this card resolves, you cannot Special Summon monsters except for WIND monsters. Three monsters for the price of one is very good, having a Harpie in each location shouldn’t be the hardest thing in the world either in a Harpie deck, the problem is the monster you have to put back into the deck has to be Harpie Lady Sisters. Unlike Harpie Lady, Harpie Lady Sisters doesn’t have any other monsters that treat themselves as Harpie Lady Sisters in any way, so you are stuck with the original and I don’t know if you want to play the original even after the new support. If Harpie Lady Elegance is destroyed by an opponent’s card effect or a Harpie card’s effect, you can add one Harpie monster from your deck to your hand. I’d say this is actually worth setting while Harpies’ Hunting Ground on the field just to pop this and get a search, I mean… Spells and Traps aren’t set by your opponent as often as they used to be, so you’ll likely have the room to destroy this during your summons since your opponent might set one or two Spells or Traps at most unless their deck is Trap heavy. Searching is always great. Both effects of Harpie Lady Elegance are hard once per turns, which I guess is fine, especially on the searching part. The biggest problem of this card is there is only one monster this card can put back in the deck, and that monster isn’t too great, but playing one of this is fine because you might want to set it just to pop it with Harpies’ Hunting Ground and get that search, though it would of been nice if this card was better to activate or if Harpies instead just got a Spell that searches. Art: 4/5 Harpie Lady Sisters are very elegant I will say. Now for the requirement/investment part…you get to Special Summon three Harpie Monsters, all which must be differently named, and they all have to come from a different place. Which is fun, and resourceful, but won’t always be something you can take advantage of. One comes from your Hand, one from your Deck, and the last from your Graveyard. So this becomes a three for three investment…depending on what else you have in your Hand and/or on the Field, it could end up being more, but on paper, this itself is just 3-for-3. You can only Special Summon Wind Monsters after this (a moot point) Like yesterday, if destroyed by a card effect of your opponent’s or a Harpie’s effect, this time you get a Harpie from your Deck added to your Hand. Each effect is once per turn, as if you’re surprised. I want to like this card, it just doesn’t do enough given that it requires a setup, and honestly, I feel it’s just going to be dead weight too often. You can always set it and wait until you have the Sisters and the required cards in your Hand and Graveyard (the Deck part is moot also) but the trade off just isn’t worth it in my eyes. Art: 3.5/5 I like the swirl, the Sisters look (pardon the obvious use) elegant enough, given the name, and that Elegant Egotist Summons them I suppose.